#54 "Hordes Preview, High Command Spoilers, Immortality - Act of Murder"
No Quarter #54 kicks things off with exciting previews of the next HORDES expansion. In addition, this issue offers pieces on the new Bodgers game Zombies Keep Out, a new Battle Report, spoilers for the next High Command releases, and the second part of a six-part adventure saga for the Iron Kingdoms Full Metal Fantasy Roleplaying Game. 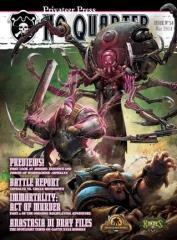 No Quarter #54, due in May 2014, has something for every player in the Iron Kingdoms and beyond.